Runway 07 : Weather ; Dull with the odd shower. G-MAJH/Eastern/Jetstream 41 c/s “East flt 101” in “102” – out. 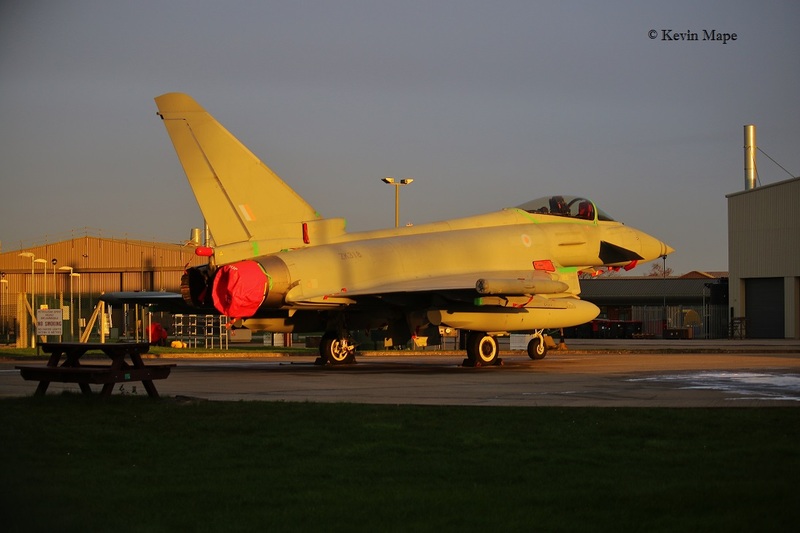 ZJ805/BD/29(R)Sqn/Typhoon T3 – Towed into the Paint shop (TMF). 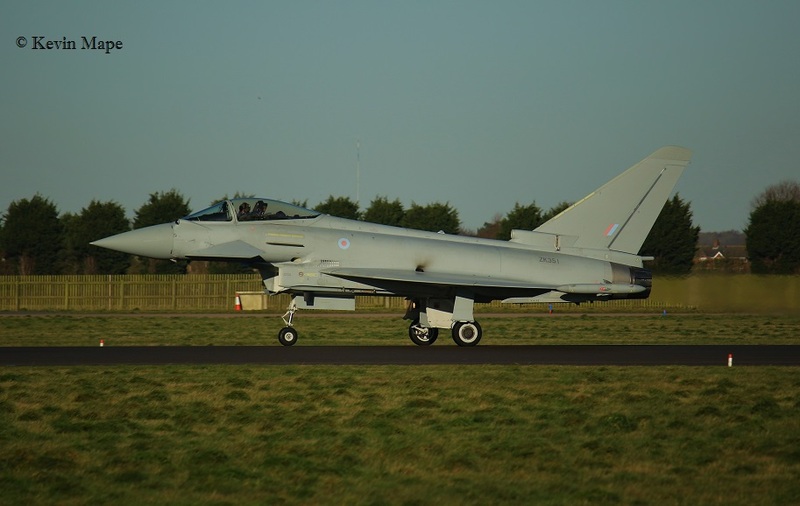 ZJ802/DW/11(F)Sqn/Typhoon T3 – ex TMF – Towed to the south side. ZK460/U/45(R)Sqn/King Air B200 GT c/s “Cranwell 69” – Rollers. ZH101/01/8Sqn/Sentry AEW1 c/s “NATO 33”- Departed. 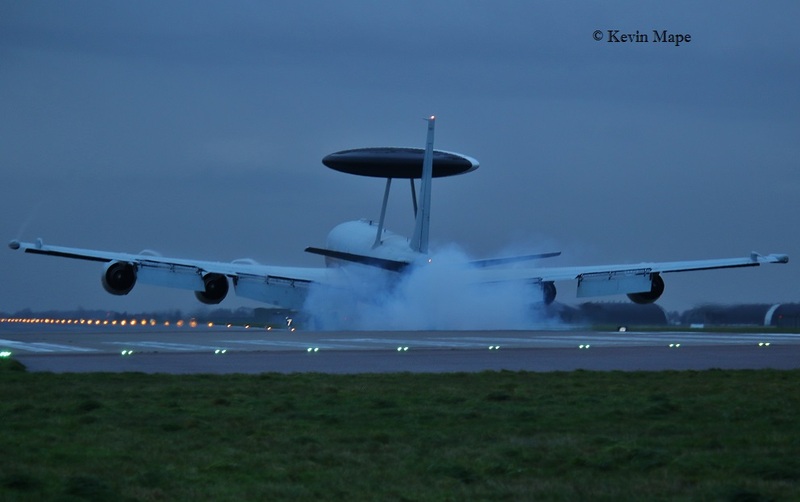 ZH101/01/8Sqn/Sentry AEW1 c/s “NATO 33 – Rollers for an hour then landed. Runway 07 – Weather – Dull with low cloud. 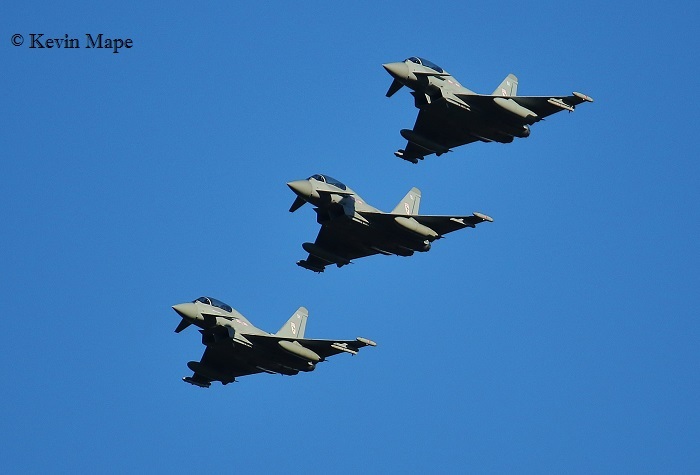 ZJ801/BJ/29(R)Sqn/Typhoon T3 c/s “Cobra 81” – Ground abort. G-MAJH//Eastern/Jetstream 41 c/s “East flt 103” in “104” – out. “Gunfighter 41” – Ground abort. 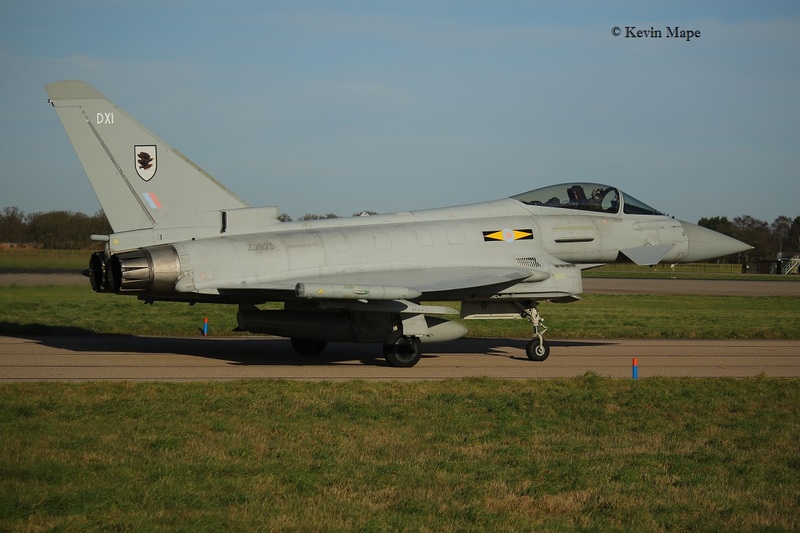 ZJ928/DS/11(F)Sqn/Typhoon FGR4 c/s “Typhoon 63” – In QRA fit. 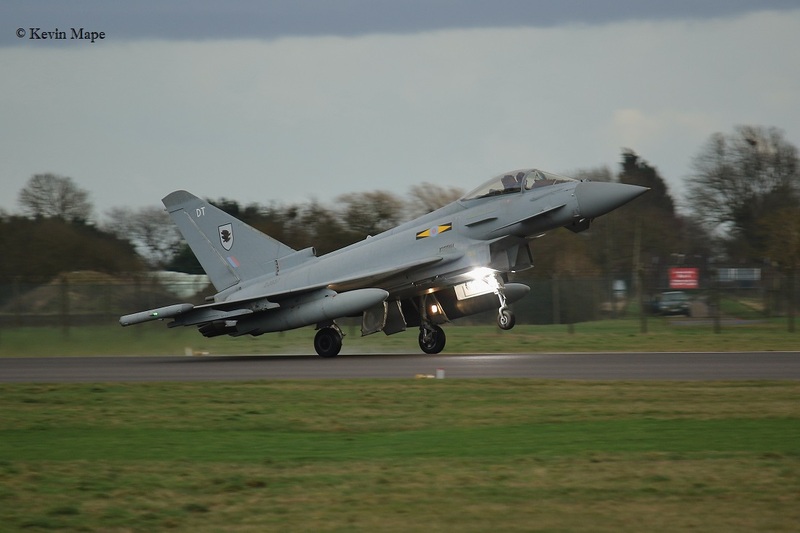 ZJ924/DD/29(R)Sqn/Typhoon FGR4 c/s “Razor 62” – Take off abort. 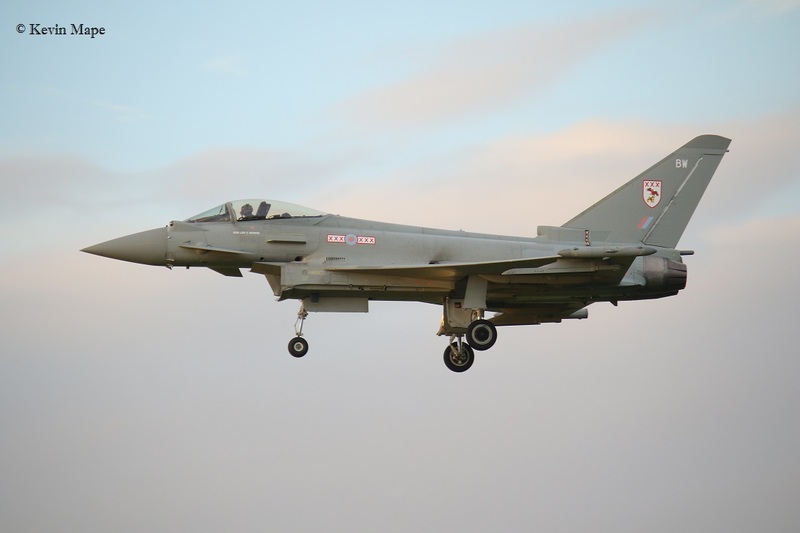 ZJ928/DS/11(F)Sqn/Typhoon FGR4 c/s “Typhoon 63” – In QRA fit. – Take off abort. Echo – ZK301/D/1435 Flt marks. 7th Thur Log thanks to Garf & Mark Thomsen. Runway 07 Rain & strong winds that cleared late afternoon. G-MAJH/JH/Eastern/Jetstream 41 c/s “East flt 102” – Parked on sierra. 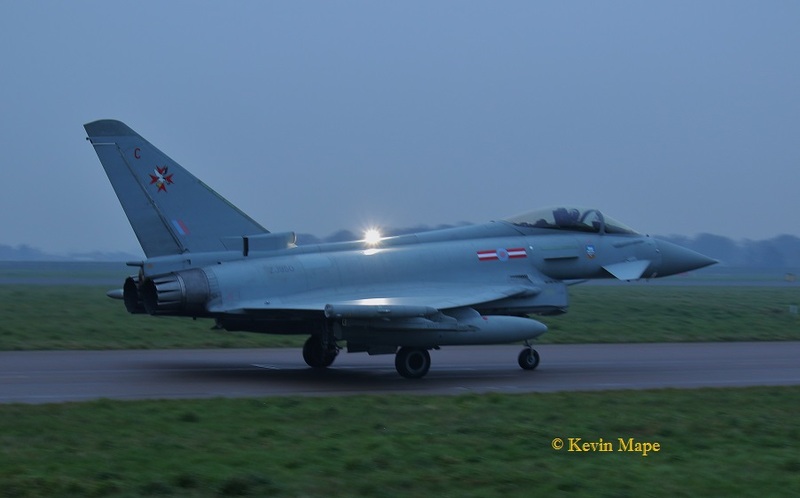 ZJ925/DXI/11(F)Sqn special/Typhoon FGR4 c/s “Razor 32” – Aborted take off due to strong winds. ZK331/BT/29(R)Sqn/Typhoon FGR4 c/s “Typhoon 42” – Display. 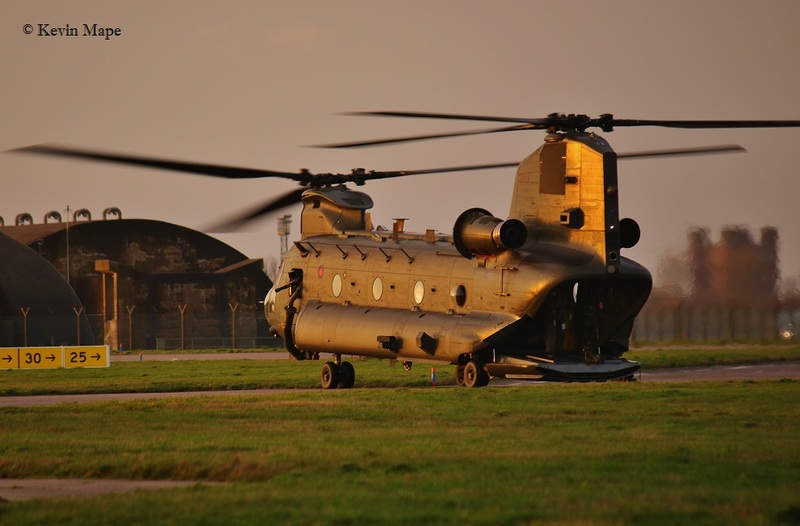 ZD981/Unmarked/Chinook HC4 c/s “Vortex 596” – Parked on Sierra. – Later departed to Holbeach. G-MAJH/JH/Eastern/Jetstream 41 c/s “East flt 103” – To Marham. 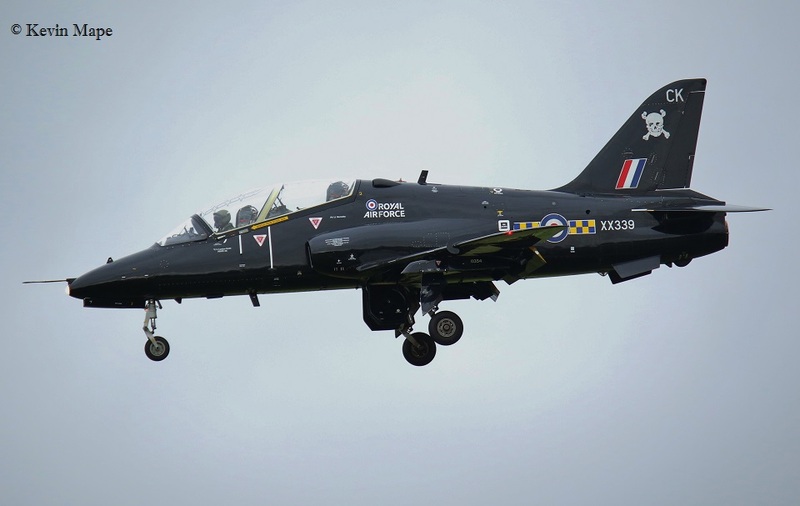 ZF378/378/1FTS/Tucano T1 c/s “Lop 469” – Overshoot. G-MAJH/JH/Eastern/Jetstream 41 c/s “East flt 101” – Parked on sierra. 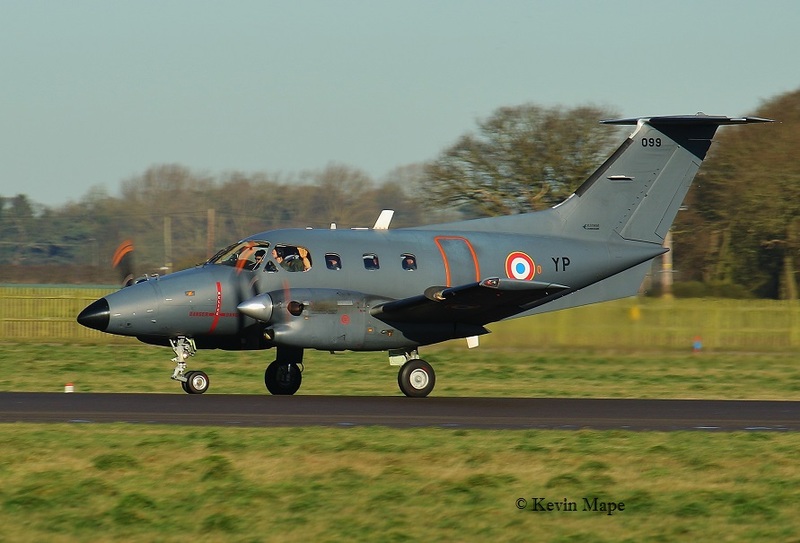 ZK459/X/45(R)Sqn/King Air B200GT c/s “Cranwell 79” – Overshoot. G-BYVH/VH/3FTS/Tutor T1 c/s “Cranwell 18” – Overshoot. A big thank you to Garf, Steve, Mark & Susie that has contributed to the Movements this week in the rainy & cold conditions. 11th Mon Log thanks to Garf & Susie. 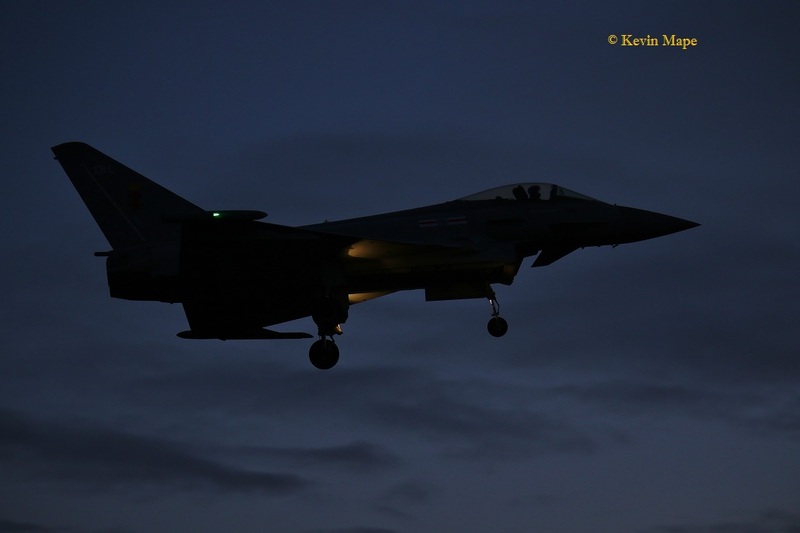 29(R)Sqn are night flying this week. No.092/YL/EAT.00.319/Xingu c/s “Cotam 1732” – Parked on Sierra. ZA548/31Sqn special/Tornado GR4 c/s “Marham 63” – Overshoot. 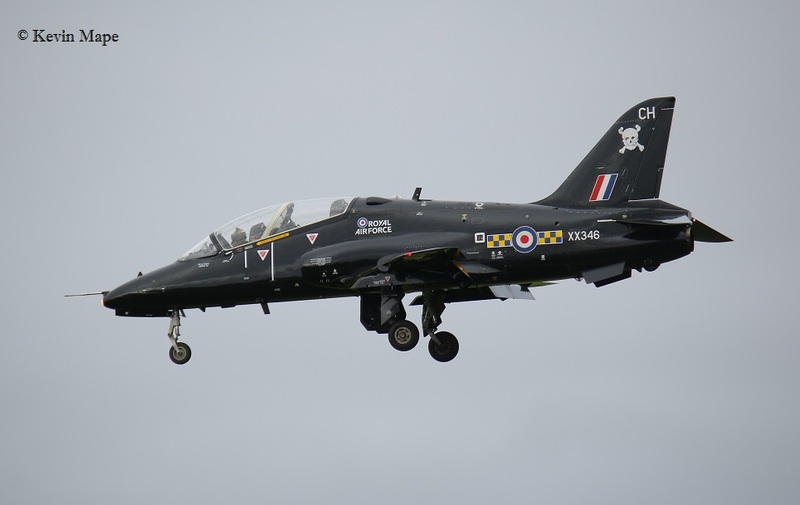 29(R)Sqn – ZJ812/BK,*ZK308/BW/ ex TP-V.
*BW f/n back in 29(R)Sqn full marks. 12th Tue Log thanks to Garf,Steve & Val. 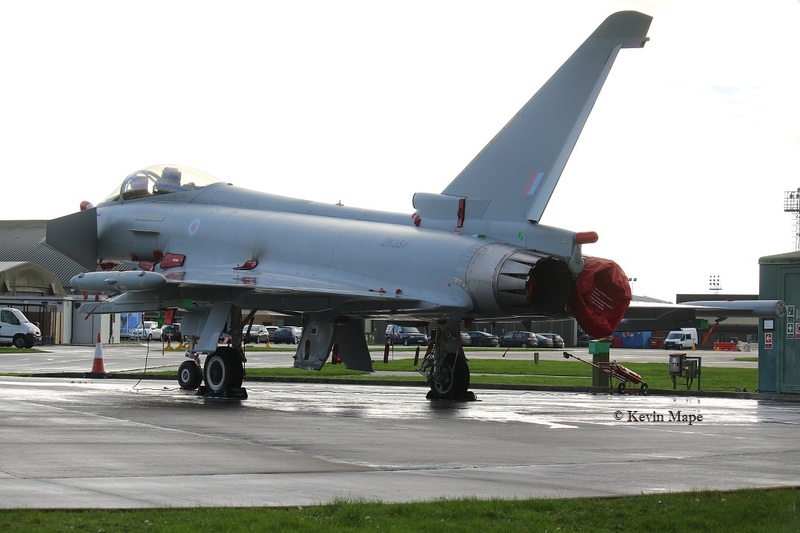 ZJ805/BD/29(R)Sqn/Typhoon T3 – Towed from TMF to Echo. 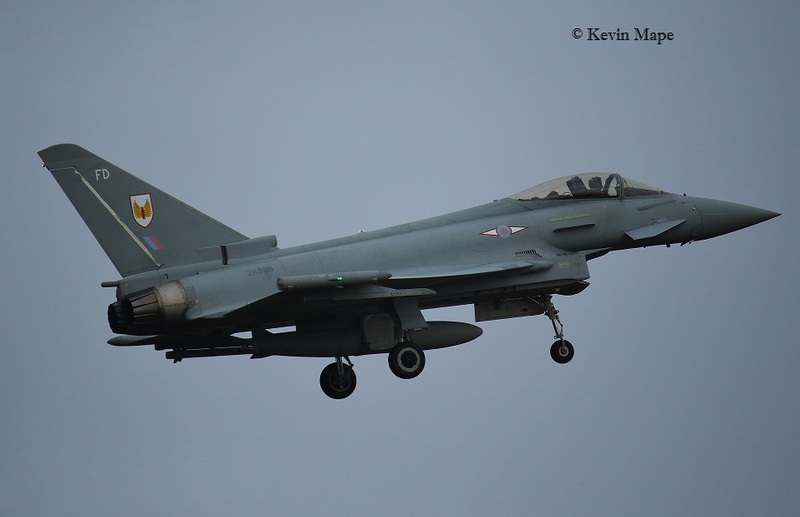 ZJ949/H/1435 Flt/Typhoon FGR4 c/s “Razor 32” PD at Lossiemouth. ZJ928/DS/11(F)Sqn/Typhoon FGR4 c/s “Havoc 42” – PD at Valley. WK518/C/BBMF/Chipmunk T10 c/s “Chippy 90” – Rollers. QRA radio check (ZJ924)/DD 15-09 pm. ZJ949/H/1435 Flt/Typhoon FGR4 c/s “Havoc 61”. 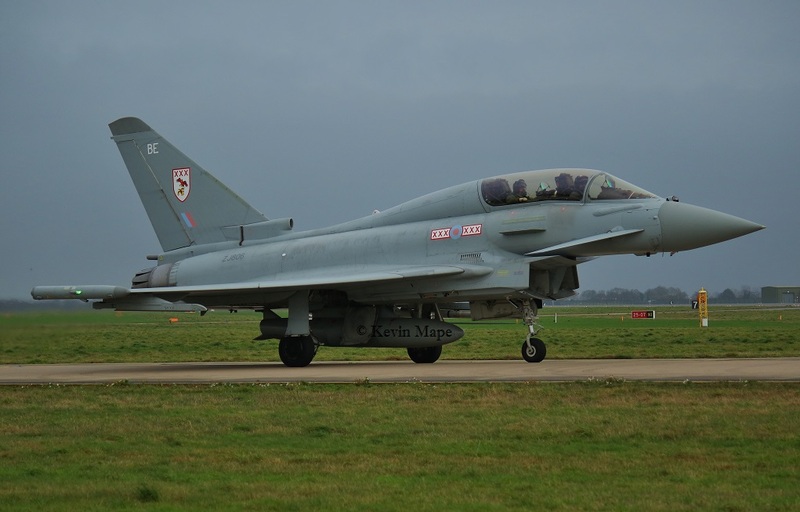 ZK317/ES/6Sqn/Typhoon FGR4 – Engine runs on the ASP. 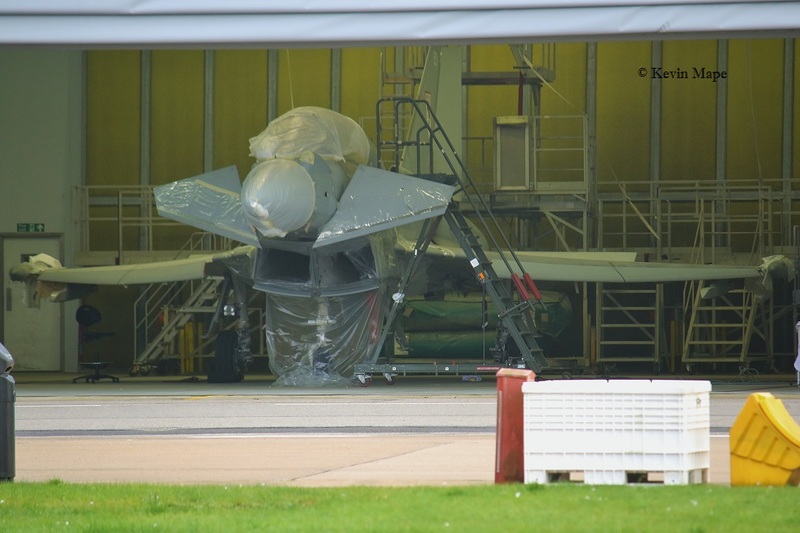 ZJ925/DXI/11(F)Sqn special/Typhoon FGR4 – Towed into Paint shop. 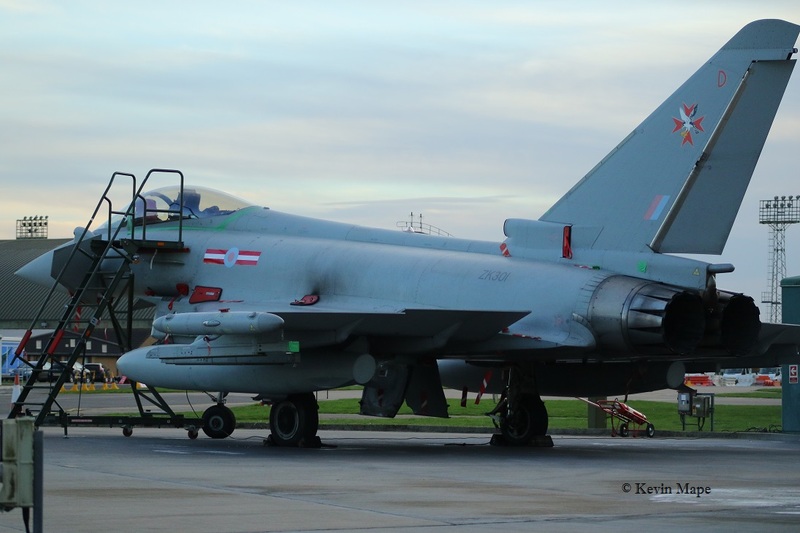 ZK330/FT/1(F)Sqn/Typhoon FGR4 – Towed into TMF. ZJ949/H/1435 Flt/Typhoon FGR4 c/s “Havoc 21”. ZJ949/H/1435 Flt/Typhoon FGR4 c/s “Havoc 41”. WK518/C/BBMF/Chipmunk T10 c/s “Chippy 92” – Rollers. ZG771/133/Unmarked/Tornado GR4 c/s “Marham 32” – Overshoot. 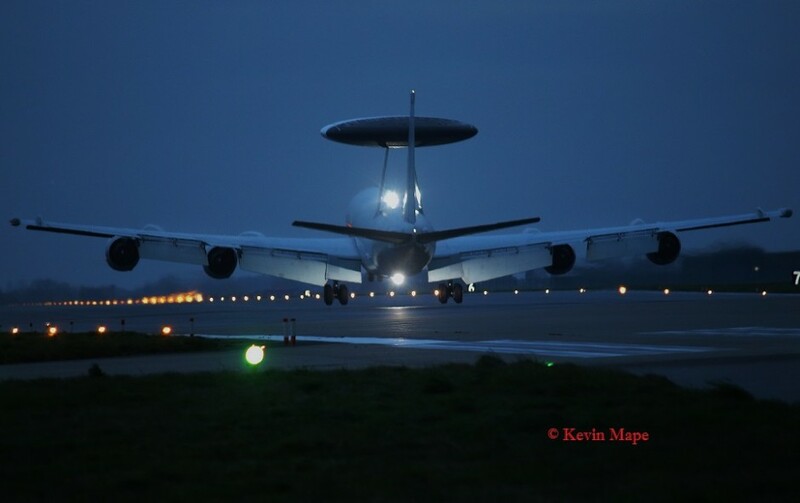 ZH106/06/8Sqn special/Sentry AEW1 c/s “Nato 35” – Landed. 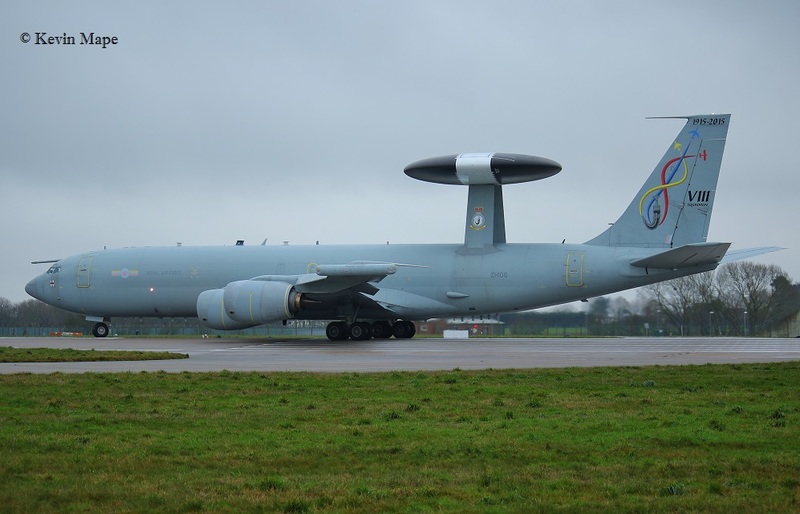 ZH103/03/8Sqn/Sentry AEW1 c/s “Ascot 7023” – Departed. Flying stopped due to high cross winds. 15th Fri Log thanks to Garf. 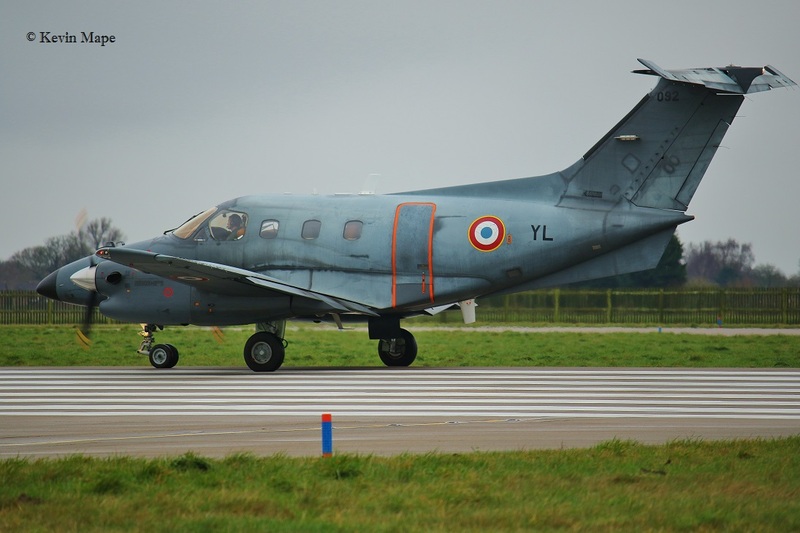 XX310/RAFAT/Hawk T1 c/s “Red **” – Overshoot. 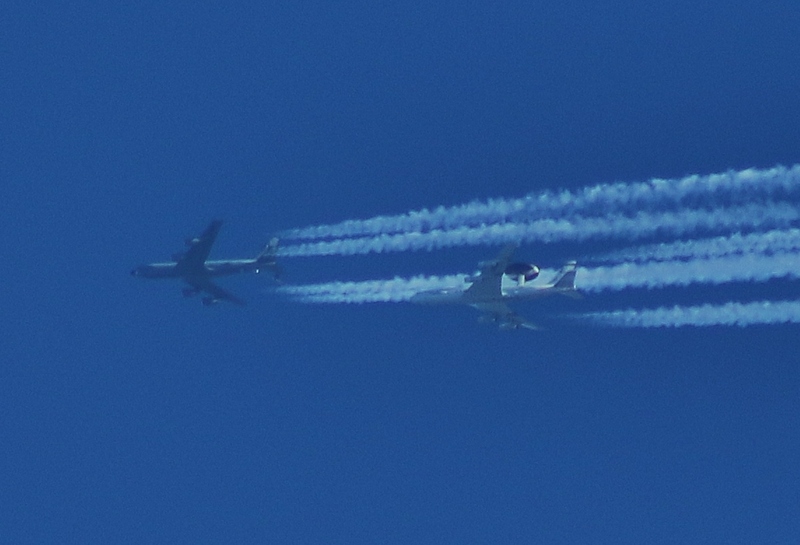 A KC-135R “Quid 199” 63-8027 about to refuel a E-3 AWACS “Shuck 82” 75-0559 just to the North of Coningsby about 10am. 19th Tue Log thanks to Steve, Val & Garf. 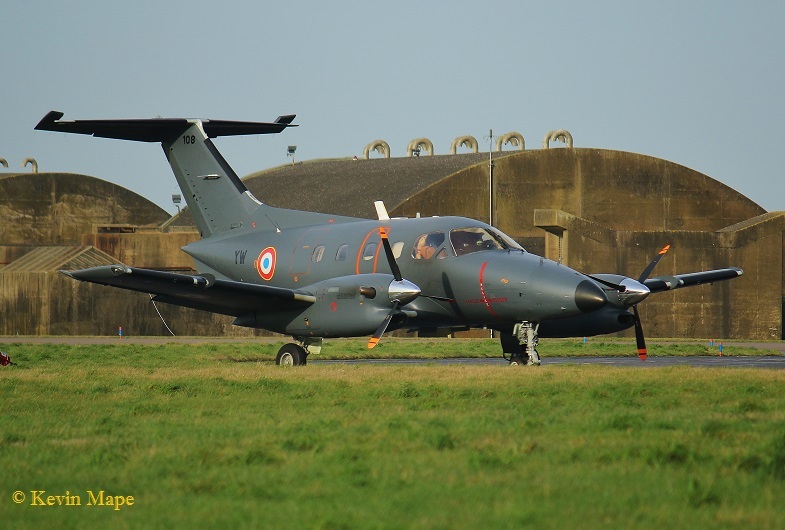 G-MAJH/JH/Eastern/Jetstream 41 c/s “East flt 102” in “103” out – To Lossiemouth. 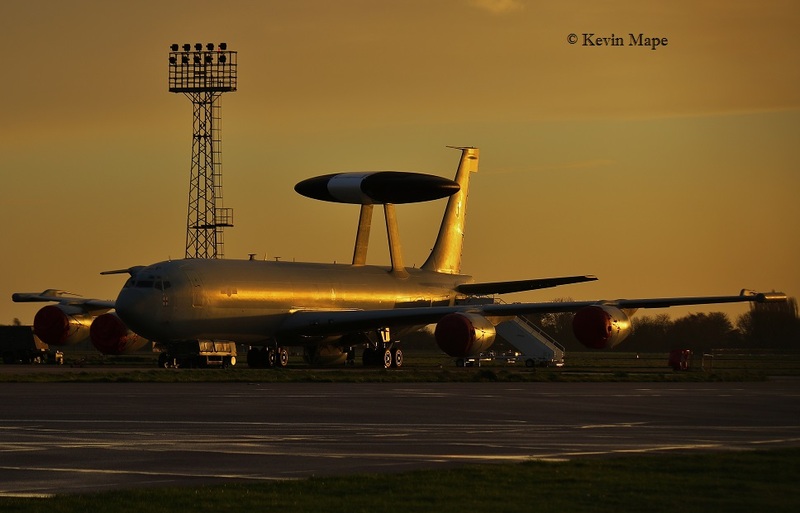 ZH107/07/8Sqn/Sentry AEW1 c/s “NATO 35” – Departed. ZJ805/BD from TMF North side to the south side of TMF. Noted on tow in Echo. 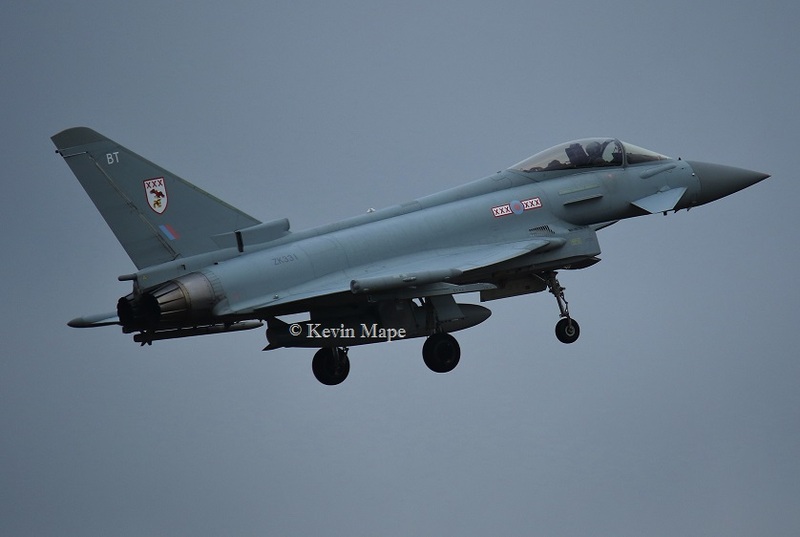 ZK337/FP/1(F)Sqn/Typhoon FGR4 – from HAS5 to HAS 8. 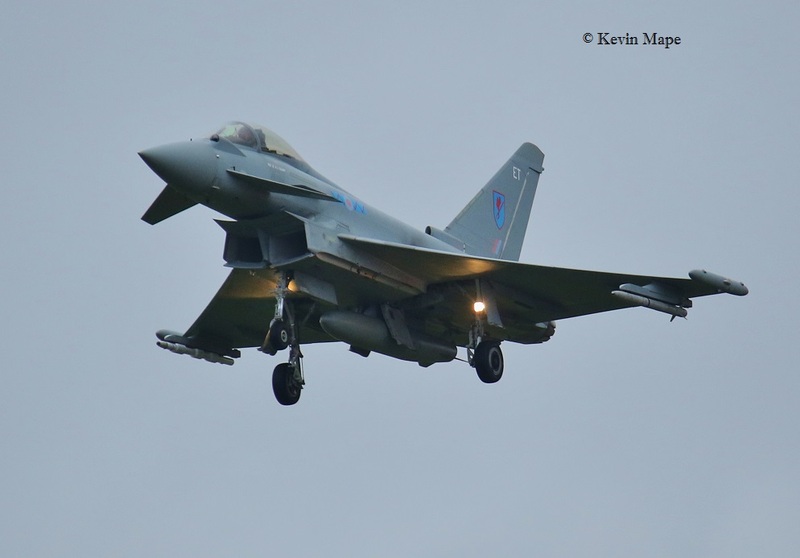 ZK301/D/1435 Flt/Typhoon FGR4 c/s “Razor 31” – Ground abort. G-MAJH/JH/Eastern/Jetstream 41 c/s “East flt 104” in “105” out . 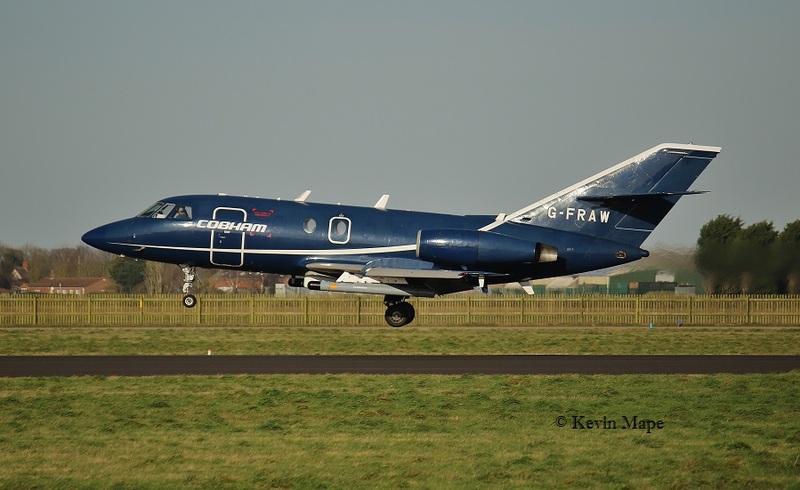 G-FRAW/AW/Cobham/Falcon 20 EW c/s “Vader 2” – working with 11Sqn. 20th Wed Thick fog all day. 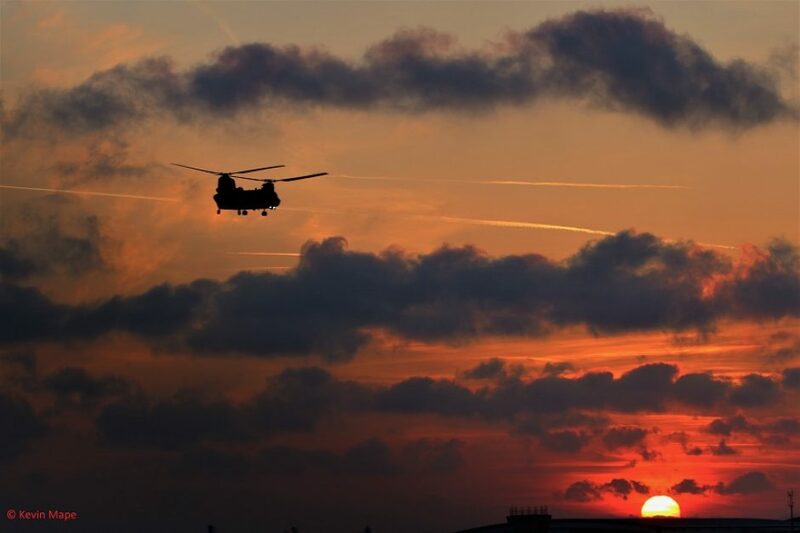 ZD981/18/27Sqn/Chinook HC4 c/s “Vortex 527” – Overfly 17-06pm. 21st Thur Sharp frost and cold all day. 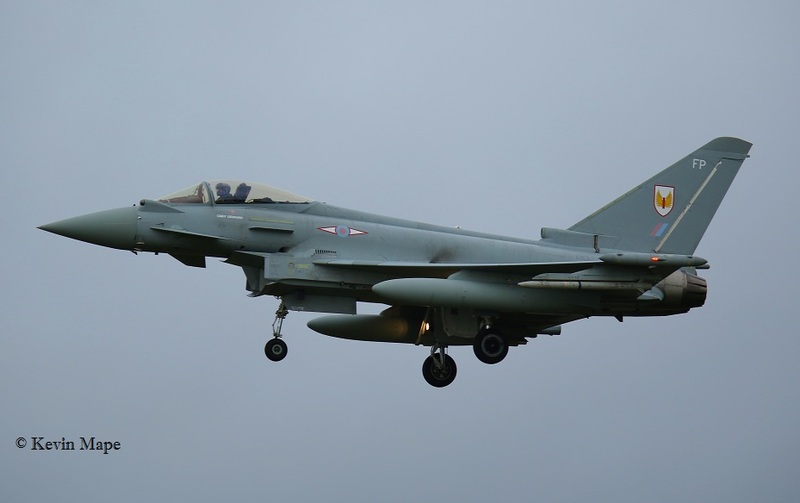 ZJ923/Unmarked(DM)/Typhoon FGR4 – Towed into HAS.1 in full QRA fit. 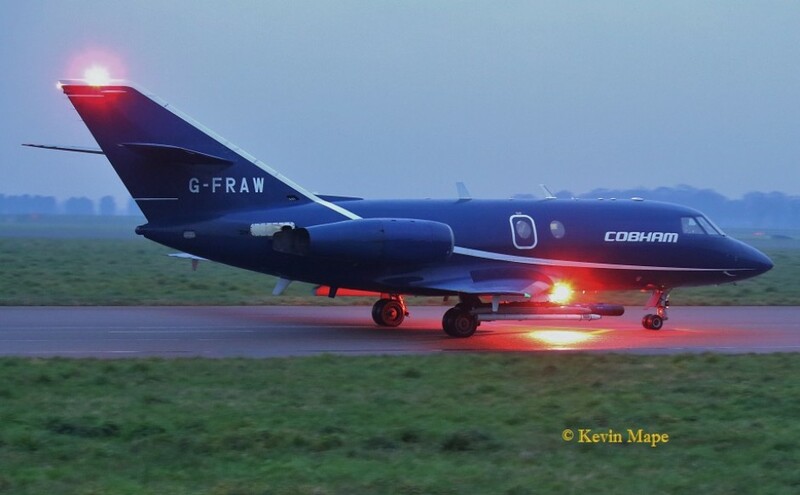 G-FRAW/AW/Cobham/Falcon 20EW c/s “Vader 2” – Departed. 22nd Fri High wind and heavy rain until mid afternoon. “Gunfighter 21” – Ground abort. G-MAJH/JH/Eastern/Jetstream 41 c/s “East flt 102” in “103” out . 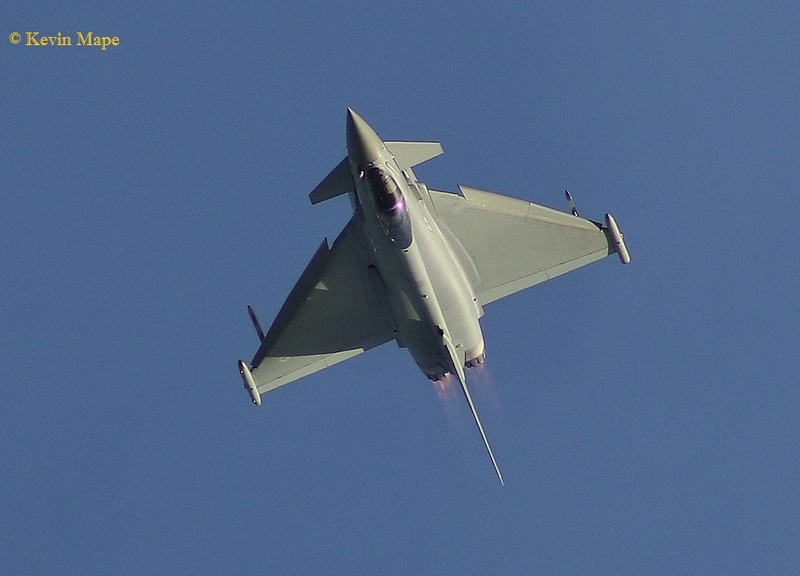 ZK304/Unmarked/Typhoon FGR4 c/s “Razor 11” – First time noted without marks. ZK308/BW/29(R)Sqn/Typhoon FGR4 c/s “Typhoon 316” – PD at Marham. 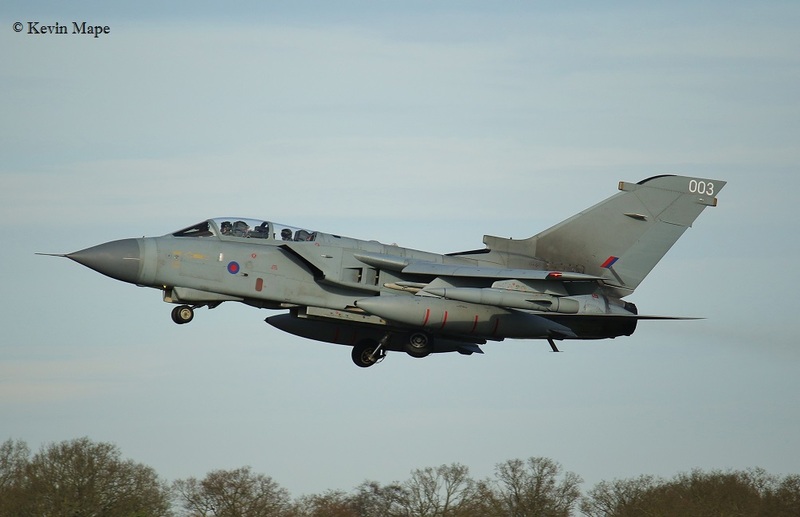 – Diverted to Marham. – f/f in marks. 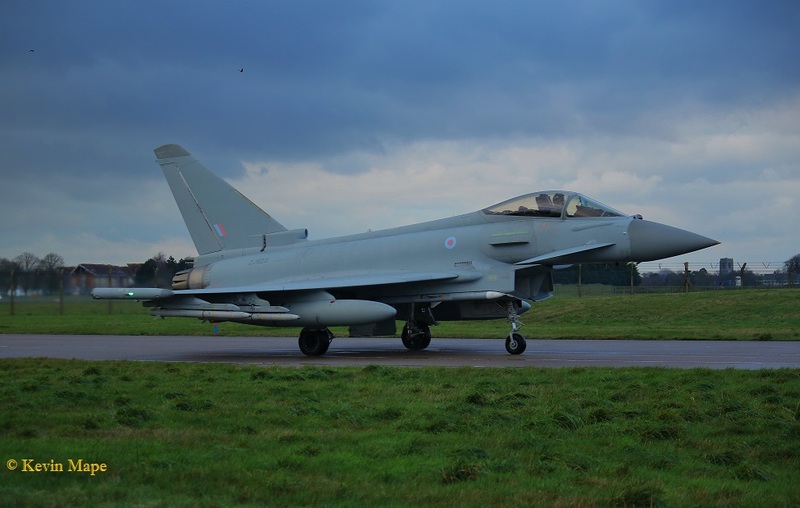 ZJ800/BC/29(R)Sqn/Typhoon T3 c/s “Triplex 12 ” – Took the RHAG on return. No.108/YW/EAT00.317/Xingu c/s “Cotam 1731” – Parked Sierra. 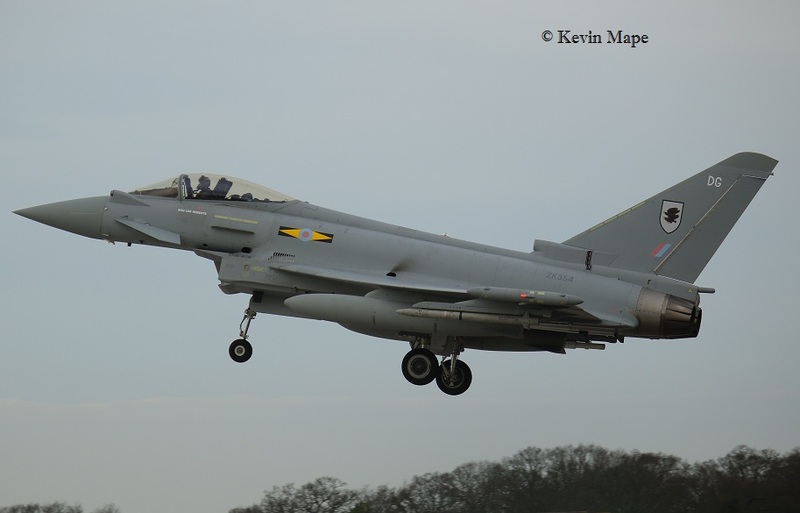 ZK325/FK/1(F)Sqn/Typhoon FGR4 c/s “Gunfighter 22” – Diverted to Marham. 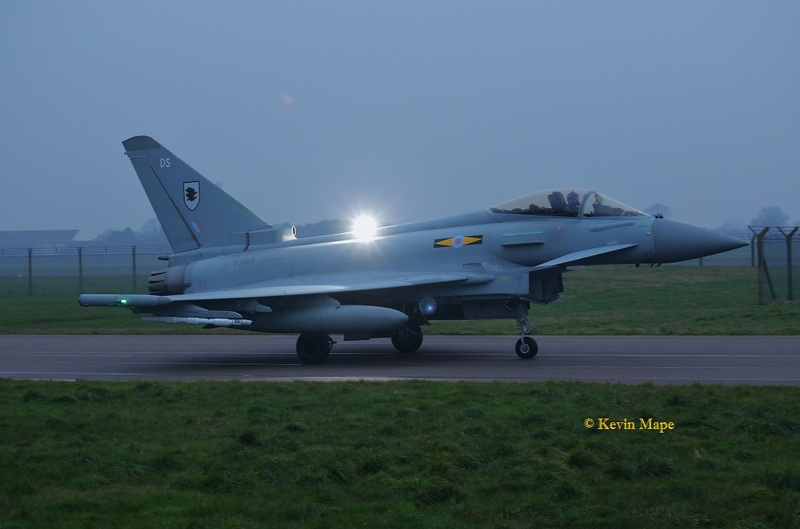 ZK336/FD/1(F)Sqn/Typhoon FGR4 c/s “Cobra 31 ” – Diverted to Marham. ZK351/Unmarked/Typhoon FGR4 c/s “Cobra 32 ” – Diverted to Marham. ZK354/DG/11(F)Sqn/Typhoon FGR4 c/s “Typhoon **” – f/f in marks. No.108/YW/EAT00.317/Xingu c/s Cotam 1731″ Departed. 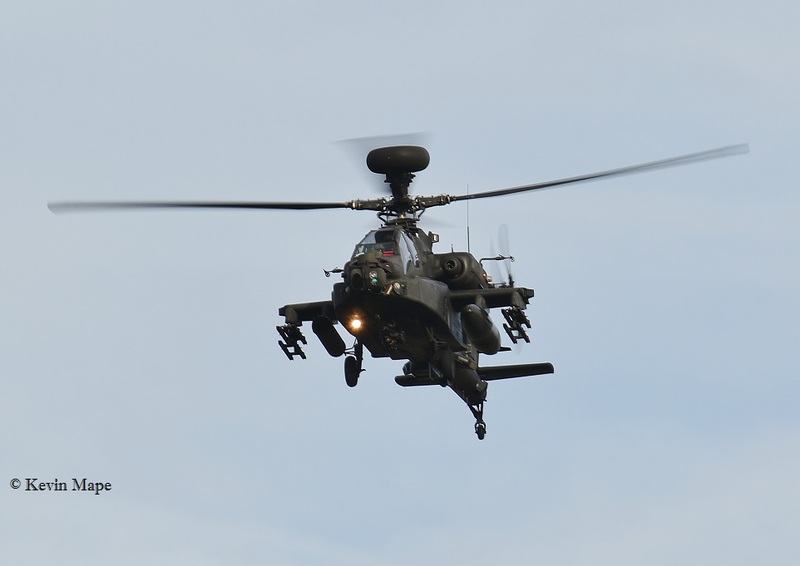 ZJ182/664Sqn/Apache AH1 c/s “Army air 444” – 2 PD’s to Wattisham. ZJ190/664Sqn/Apache AH1 c/s “Army air 445” – PD’s to Wattisham. 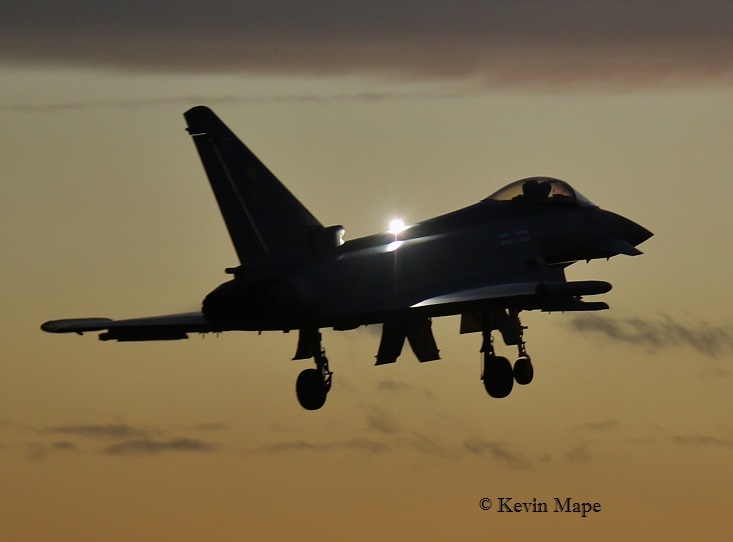 ZK308/BW/29(R)Sqn/Typhoon FGR4 c/s “Typhoon 316” – Return from Marham. ZK336/FD/1(F)Sqn/Typhoon FGR4 c/s “Cobra 31 ” – Return from Marham..
ZZ332/10Sqn/Voyager Kc2 c/s “Tartan 11” – Overfly. Noted on the Wash pan AM- ZK315/41(R)TES special, PM – ZJ947/EB-L.
Wash pan – ZK337/Unmarked (ex FP) – Towed to Echo. G-MAJH/JH/Eastern/Jetstream 41 c/s “East flt 102” in “103” – out. 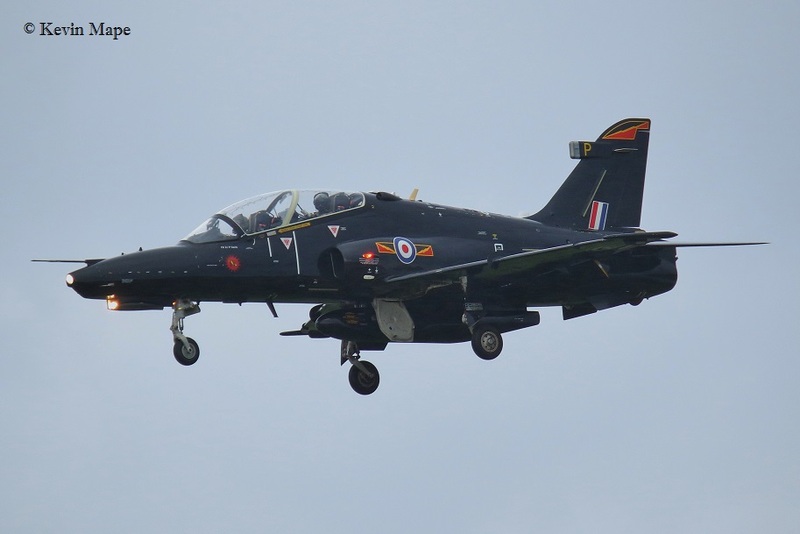 G-BYWB/WB/3FTS/Tutor T1 c/s “Cranwell 90” – Overshoot. 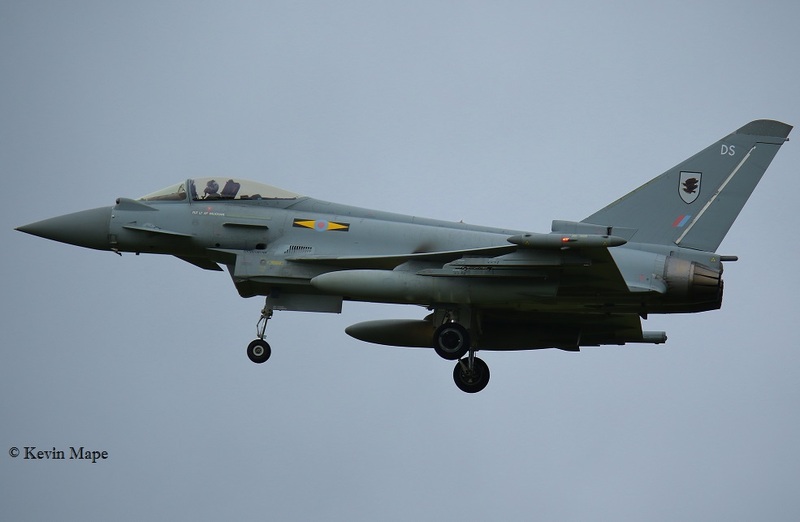 ZJ923/Unmarked/Typhoon FGR4 c/s “Razor 11” – Returned on a PAN. 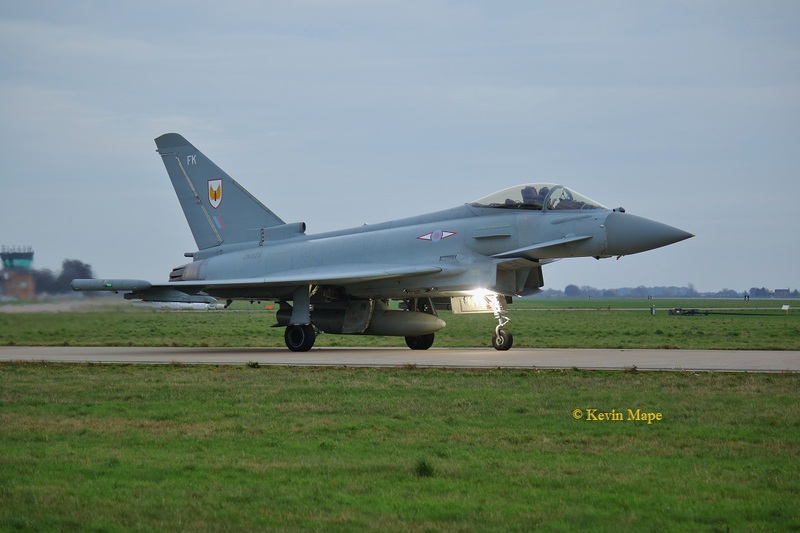 ZJ925/DXI/11(F)Sqn/Typhoon FGR4 c/s “Razor 12” – f/f in standard marks. 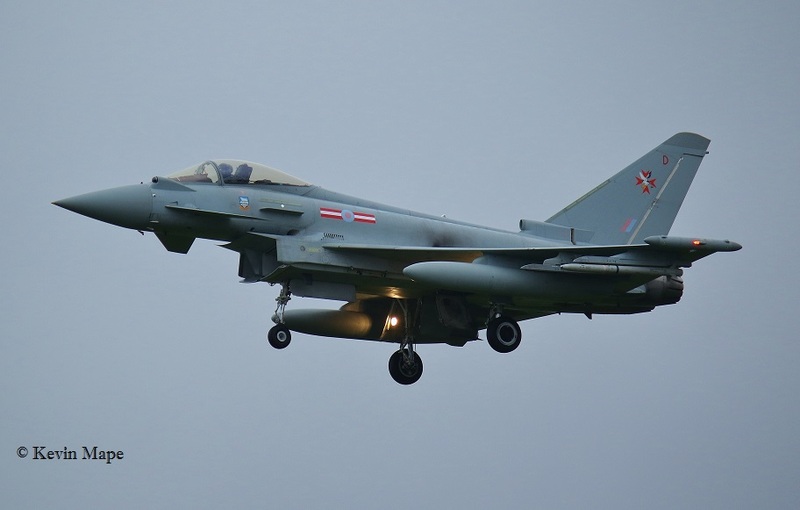 ASP – ZK317/ES/Unmarked/Typhoon FGR4 f/n with code only. Base closed to flying due high cross winds. 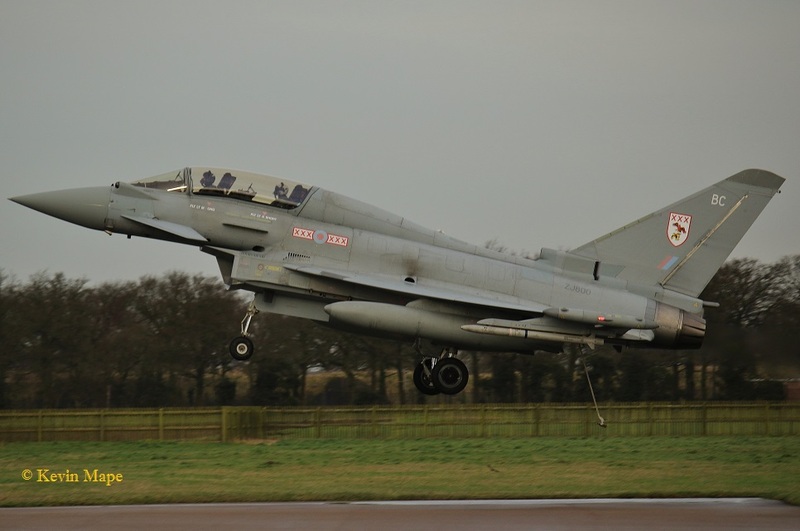 ZJ919/DC/11(F)Sqn/Typhoon FGR4 c/s “***********” QRA – to 25 end lazy held, Then Returned to HAS. 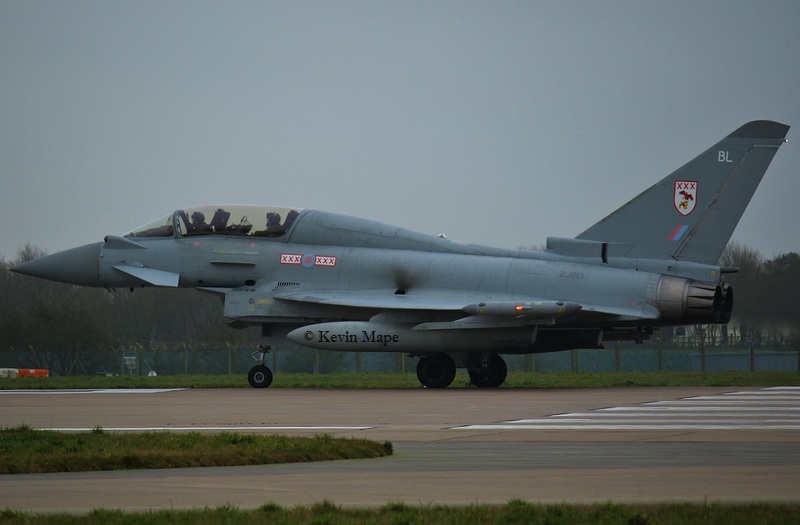 ZK301/D/11(F)Sqn/Typhoon FGR4 c/s “***********” QRA – to 25 end lazy held, Then Returned to HAS. XX202/CF/100Sqn/Hawk T1A c/s “Capture 2” – Parked on Sierra N/S. XX339/CK/100Sqn/Hawk T1A c/s “Capture 1”- Parked on Sierra N/S. G-FRAW/AW/Cobham/Falcon 20 EW c/s “Tasman” Parked on Sierra N/S. 28th Thur Log thanks to Steven nffc. No.078/YE /EAT00.319/Xingu c/s “Cotam 1718” – Parked on Sierra. 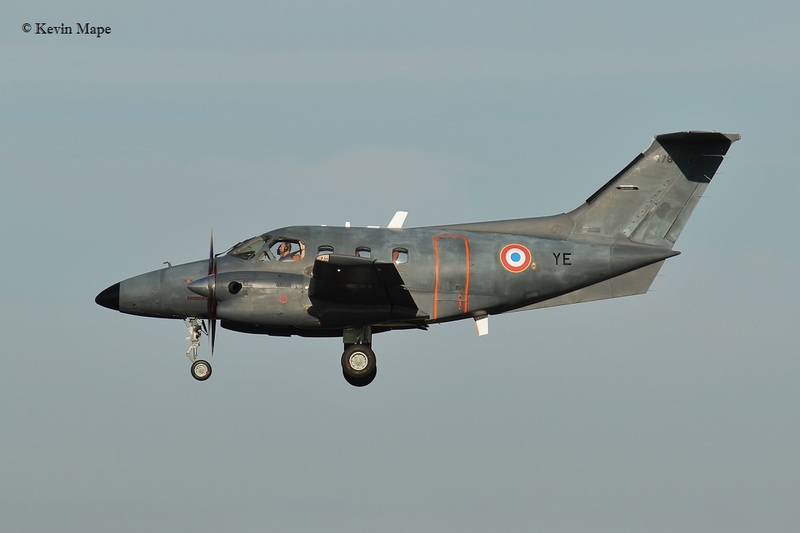 ZF243/243/1 FTS /Tucano T1 c/s “LOP 48” – Overshoot. 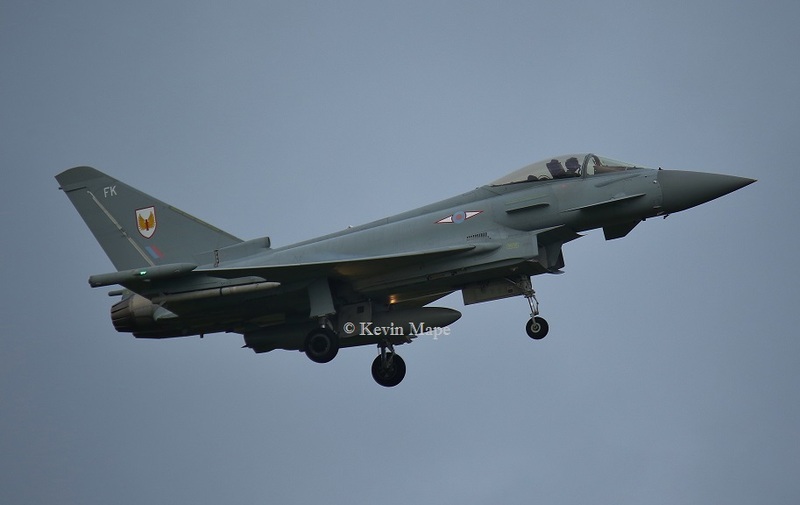 ZJ936/QO-C/3(F)Sqn/ Typhoon FGR4 c/s “Spartan 11” – Returned from Lossie. ZA369/003 /12(B)Sqn / Tornado GR4 c/s “Wolf 12”- Overshoots. ZJ924/DD/11(F)Sqn -Towed into QRA shelter. 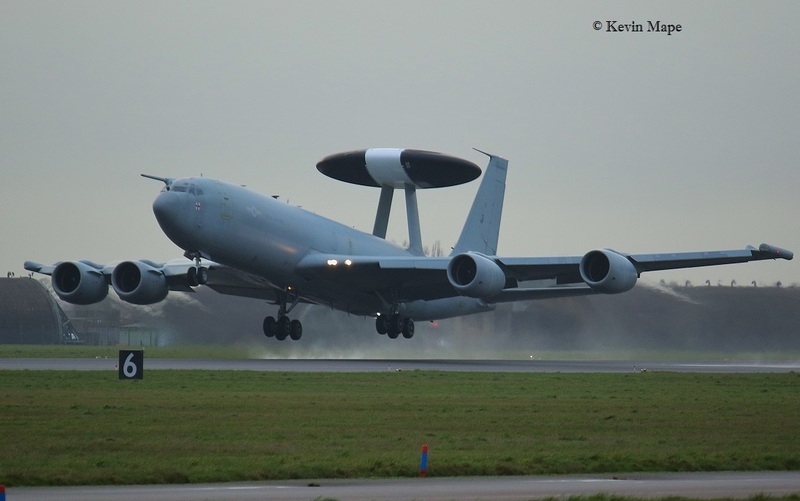 ZH107/07/8Sqn/Sentry AEW1 c/s “NATO 35” – Ground abort. ZJ932/DB/11(F)Sqn/Typhoon FGR4 c/s “Ascot 9611” – Both to Echo. G-MAJI/JI/Jetstream 41 c/s “East Flt 102” in “103” -out. 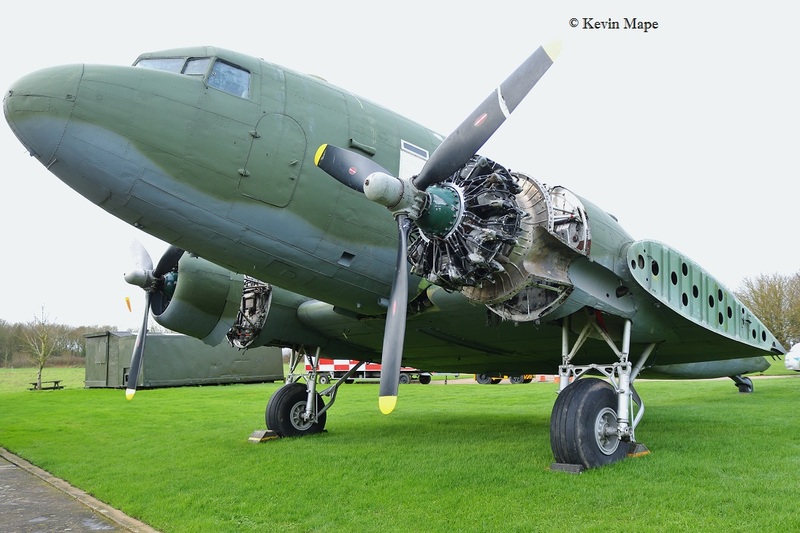 ZK317/ES – Engine runs on the ASP – 26/1/16 f/n code only. ZJ805/BD – Towed to the Southside – 12/1/16 – later back into TMF. Noted in Echo 26/1/16.